Want to relax and participate in one of the most visually exciting activities you can do while in Belize?... Well enjoy canoeing and kayaking in and around the area's rivers, canals and fabulous lagoons. You can be sure you will enjoy the lush flora and numerous wildlife sightings while soaking up the sun. Cocos Lagoon and Progresso Lagoon provide fabulous paddling adventures and are located at the lagoon shoreline of our Progresso Heights development for all residents to enjoy. Other waterways such as Laguana Verde lend themselves to inspiring paddling adventures. 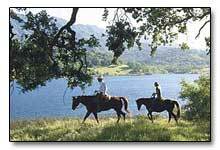 Laguna Verde is a small spring fed lake located about four miles north of Gallon Jug near Chan Chich. Its name, Laguna Verde refers to the emerald green hue of the water. As you approach the lake you will find a small bathhouse which offers canoes, oars and lifejackets for rent. Once inside Laguna Verde you will see scenic beauty, birds singing and the wail of the howler monkeys infectiously charming. There are two small islands inside supporting various wildlife as well as dense flora… A great hold-over for weary paddlers. You should also plan a trip to explore Dawson Creek and the New River Lagoon. Start by paddling up Dawson Creek from the New River Lagoon. You will notice a vivid presence of wildlife within the tropical flora during your journey. Canoeing through the water lilies is in itself relaxing and be sure to notice the fish feeding on insects that are resting on the water’s surface. The entrance to Dawson Creek is only about five hundred feet from the Lamanai Outpost Lodge. Another journey worthwhile taking is exploring Fish Creek located at Blue Creek Village. This creek is truly a bird sanctuary where one can record sightings of many species including Green Heron, Bromeliad Flycatcher, Anhinga, Great Blue Heron, Kingfisher, Boat Bill Heron, Tiger Heron, Cormorant, Red Winged Blackbird, Night Heron, Pygmy Kingfisher, Social Flycatcher, Amazon Kingfisher, Fruit Bat and Agaumi Heron. Fish Creek is lined by Red Mangrove as well as water lilies and serves as a home to a variety of invertebrate and juvenile fish species. The Rio Bravo joins Fish Creek just a few miles up the creek. Further up river as it widens one can see orchids and bromeliads setting on mangroves, coconut palms and palmettos. As the current picks up and paddling becomes easier the journey soon comes to an end in the green waters surrounding Blue Creek Village. 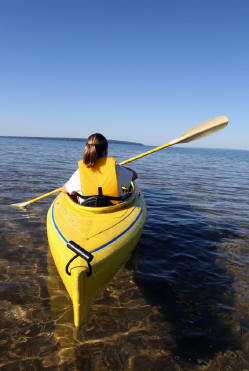 Sea kayaking has also grown in popularity because of the relatively calm, reef-protected seas. 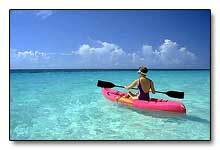 Sea kayakers favor the calm waters of the Chetumal Bay area and Hol Chan Channel. Water skiing, windsurfing, Sunfish and Hobie Cats sailing are also popular. Most resorts offer instruction and rental equipment upon request. 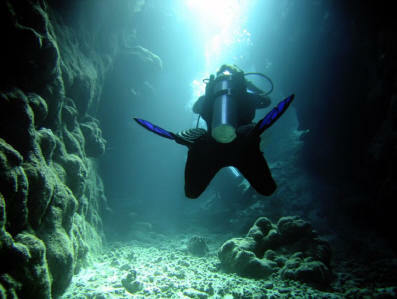 Belize is known to have some of the finest diving in the northern Hemisphere. Why? Belize is situated next to 176 miles of continuous reef. Nearly every species of Caribbean coral grows in its waters? such as pillar, brain, elkhorn and lettuce leaf, just to name a few. Millions of fish as well as an unparalleled assortment of reef life come together with divers and snorkelers exploring their waters. 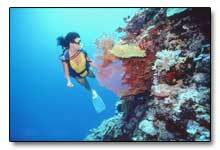 Most dive operators in northern Belize depart from both Sartenja and Corozal. Certainly the most popular dive destination in northern Belize is Boca Bacalar Chico Marine Reserve. This reserve is a protected area under the management of the Belize Fisheries Department. This organization supports controlled tourism activity in the Marine Reserve while offering education of fisheries management and preservation of the marine habitats. Tours and dive trips at Boca Bacalar Chico can be arranged locally. Not far offshore you will find numerous dive operators in San Pedro on Ambergris Caye. These operators dive points of interest in and around the Belize Barrier Reef as well as traveling to the Lighthouse Reef Atoll where one can find some of the finest Belize dive spots such as the Blue Hole, explored by Jacque Cousteau as well as the world renown sites around Long Caye at Lighthouse Reef at the southern end of the Atoll. Belize is a country having 40% of its lands and waters protected. With an aggressive, interactive approach to reserve management Belize encourages eco-tourists to visit research stations and field schools to advance and promote its position for sustainable resource use. This is accomplished through controlled eco-tourism, continuing education and anthropological and ecological study. As resident experts on regulated land use and eco-tourism, these field stations are open to the public for an alternative to a traditional vacation. 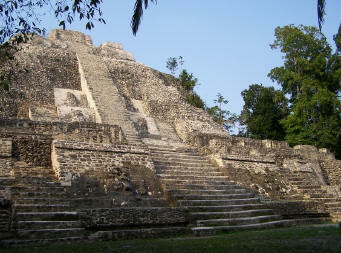 Lamanai Outpost Lodge is recognized as the foremost authority of the Lamanai Archaeological Reserve. This Mayan center, Lamanai (meaning submerged crocodile) thrived for nearly three millennia. The Lodge that overlooks the New River Lagoon combines education, relaxation and exploration in a habitat rich in history and ecology. This research center, a Belize non-profit organization has been active since 1992. It offers the largest inland body of fresh water in Belize, several endangered species, over 350 species of birds and over 700 Mayan structures making it a wonderful research and educational site for many scientific disciplines. The Rio Bravo Conservation and Management area is a national example of sustained forestry development supervised by Programme for Belize, a private, non-profit, Belize based organization dedicated to the preservation and management of Belize's natural resources. This 250,000 acre preserve served the logging industry for many years. However, due to the intensity placed on many precious hardwoods such as cedar and mahogany, these hardwoods have been reduced to alarmingly low levels in recent times. Since 1992 Programme for Belize has regulated timber cutting, promoted low-impact tourism and funded research in agro forestry, forestry management education as well as preservation-minded low impact eco-tourism. In addition to an abundant wildlife population, the area contains over sixty Mayan archaeological sites with the Mayan site of La Milpa as the largest. This site offers an education center, accommodations and guided trails within the site. The Programme for Belize also manages the Hill Bank Research Station, established in 1996 on the New River. It also has the same initiative as the Rio Bravo Conservation and Management Area with sustainable forestry management controlled eco-tourism and research as its objectives. Hill Bank was originally a mahogany logging camp for British buccaneers and African slaves in the seventeen hundreds. The Village of Hill Bank was eventually abandoned after the mahogany population was nearly depleted. Although the logging industry is depressed, the forest lives on under the management and protection of conservation initiatives and funding from the eco-tourism industry. The Mayan Research Programme has sponsored annual excavations at the ancient Mayan site of Blue Creek in northwestern Belize since 1992. This non-profit research organization affiliated with Texas Christian University in Fort Worth, Texas has studied the ancient Maya civilization with the hope of better understanding its rise and eventual fall. The Maya Research Program endeavors to inform the public about Mayan Culture while managing, protecting and preserving Mayan artifacts and ruins in Belize. Paul and Zoe Walker run the private organization located in the Shipstern Reserve known as WildTracks. In close proximity to the Mexican border the WildTracks are workshops for Belizean and British children that have promoted and initiated such programs as the breeding of deer, and the development of medicinal and mahogany plantations. In the past few years, WildTracks has worked to conserve the area that falls within the Meso-American Biological Corridors Program which links reserves throughout Belize and Central America in an international effort to ensure the preservation of the area's rich ecological and biological diversity. These continuous bands of reserves provided unhampered corridors for wildlife to move freely from one area to another. It is no wonder that bird watching is so popular in Belize, a country the size of Massachusetts and home to over 570 species of birds. This is considered remarkable while just over 800 species of birds have been documented in all of North America. The diverse and largely undeveloped habitats within the country support this remarkable bird representation. Observations and sightings are abundantly available while taking nature walks, tours, river expeditions or while visiting any of the numerous cayes (islands) of Belize. 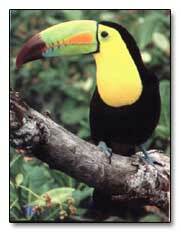 The nature reserves of northern Belize are unquestionably the home to the largest bird populations. Shipstern Wildlife Reserve and the Rio Bravo Conservation Area enclose the largest bird sanctuaries in the north. The Yellow Lored Parrot, Black Catbird, Reddish Egret, White Winged Dove and the Yucatan Jay are among just some of the birds that are found at the Shipstern Lagoon housing over two hundred species. Many of these birds migrate from North America during the winter. The Rio Bravo Conservation and Management Area is home to at least 344 species. The New River as well as the Lamanai Archaeological Reserve also has a uniquely diverse bird population. Bird watchers will find many accommodations within these areas having birding tours with trained professionals upon request. 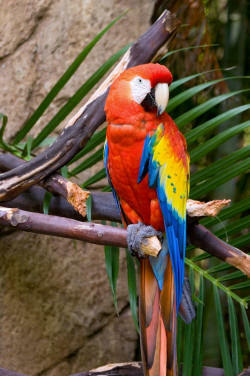 Nature trails, recorded species lists and bird watching towers are found in many locations throughout Belize. The Belize Audubon Society has created special itineraries that explored forest, reef, savannah and wetland habitats. 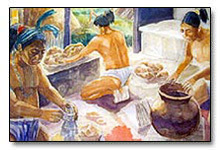 Both Progresso and Cocos Lagoon served as passage for Mayan merchants at the height of the Mayan Era. These waterways in the Corozal District are located only 10 to 12 kilometers from the Caribbean Sea. Once a military lookout and post and busy trading area? Progresso and Cocos Lagoons today serve as an area of unique ecological diversity within a serene, tranquil environment. On the western side of Progresso Lagoon lies the charming little village of Progresso. In recent times, Mennonites settlements have transformed the area and given it a new sense of cultural diversity. The Mennonite still believe that modern machinery and equipment will contaminate their faith and to this day most drive horse drawn buggies similar to the Amish of Pennsylvania, U.S. and will not use automated farm equipment. The long, wide and irregularly shaped lagoons provide wonderful beachside picnicking, kayaking, canoeing, fishing and swimming. Within Progresso Lagoon you will find Caye Coco. This ancient Mayan hub, a post-Classic monumental center may be the colonial Maya site of Chanlacan, the capital Chetumal after the fall of Santa Rita and seat of the 1547 rebellion against Spanish Bacalar. More recent excavations of Caye Coco have uncovered cemeteries, courtyards and buried residential platforms. 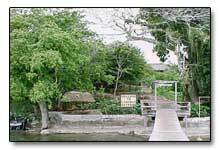 Visitors can find access to Progresso and Cocos Lagoons either through Orange Walk Town? after crossing the bridge in Orange Walk drive approximately 8 kilometers and you will arrive at San Estevan Village. Continue down George Price Street and follow the pavement as it turns right. Proceed another 14 kilometers until you reach Progresso Lagoon. You can also get to Progresso Village by taking the boat ferry across the New River. Once across the New River you will pass the Progresso Heights development, then proceed about 5 ½ miles to the Village. The New River Ferry is a must see for first time visitors to the area. There is no shortage! Combine the rich heritage of northern Belize with its diverse landscape, numerous historical landmarks, remarkable forests having unlimited trails, ready for hiking with guaranteed wildlife sightings? the rivers, bays, lagoons, cenotes and barrier reef just offshore? and you will have yourself a wonderful life now and for generations to come. The bays, rivers, lagoons and coastline of northern Belize support rich and abundant fishing environments. Snapper, Triggerfish, Grouper, Bonefish, Barracuda, Rainbow Runners, Tarpon and many other large species frequent the waters of the barrier reef and its outer atolls. In the deeper waters beyond the reef sport fishing is fabulous where you can catch Marlin, Sailfish, Mackerel, Wahoo, Bonito, Black Fin, Blue Fin and Albacore Tuna as well as Pompano. Full and half day fishing excursions in the deeper waters or trolling in the shallows of the protected reef are offered by experienced guides. 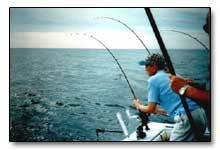 Anglers may book private charters, smaller boats or party boats year round. Prices vary depending on the type of fishing, number of passengers, size of boat and time of year. Northern Belize is home to a large resident population of tarpon averaging 50 pounds in the winter while exceeding over 100 pounds in the summer. Bonefish also have a year-round presence. Step off the beautiful beaches of Long Caye at Lighthouse Reef and you will find yourself in a healthy fish flat. Ambergris Caye, north to Rocky Point at the Bacalar Chico channel are considered to be two of the finest bone fishing areas in the country? Some have been known to reach 80 pounds. The fisherman of Sarteneja are among the best in the country. This charming little fishing village has gained notoriety as a fisherman's hot spot far Barracuda, Snapper and Tarpon. Freshwater fishing in the lagoons of northern Belize have gained popularity. They support vibrant populations of Snook, Tarpon, Cubera and Snapper throughout the year. Corozal Bay is home to abundant fish populations capable of making the transition to saltwater. Visitors should first inquire about fishing regulations in the nearby towns prior to visiting one of the lagoons or rivers. A significant portion of Belize's pristine marine eco-systems are protected with many areas designated as World Heritage Sites. United Nations funding and regular monitoring helps protect these areas. These inhabitants and habitats may not be destroyed or harmed in any way. Most tour guides and fishing guides enforce local catch and release fishing as well as low-impact fishing practices. Chan Chich region has guided horseback rides, which leave daily from Gallon Jug Stables. The tour guides with trained horses take visitors through the Gallon Jug farm area, through nearby jungle trails as well as into and through the forest roads and trails. Rides to Punta de Cacao and to other Mayan ruins sites can be arranged with local tour operators. Long rides with a packed lunch are available, however most rides usually last approximately two hours, In Blue Creek the Mennonites offer a fairly unique horseback riding experience. One can explore unexcavated Mayan mounds and ruins, which may include uncovered buildings and homes as well as blazing a trail across extensive farmlands. Early evenings just before sunset you can help the Mennonite cowboys round up the cattle into the corral. The cattle herders must be careful not to leave calves behind and also make sure that none wonder off into the pastures. of Belize, natural history, vegetations and wildlife. Click here for sample home plans and building information. Click here to find out why to buy in Progresso Heights. Take virtual tours of this pristine environment. Join our email and phone list! We will tell you about new offerings & opportunities in Belize. To speak to one of our representatives, call us toll free in the U.S. or Canada at 1-888-BELIZE 4 U (1-888-235-4934). From outside the U.S. or Canada we may be reached at 561-859-1433. Copyright © 2010 Progresso Heights Limited All rights reserved. Prices, terms and features are subject to change without notice. Obtain the Property Report required by Federal law and read it before signing anything. No Federal agency has judged the merits or value, if any, of this property. This does not constitute an offer to sell real property in any jurisdiction where prior registration or other advance qualification of real property is required.